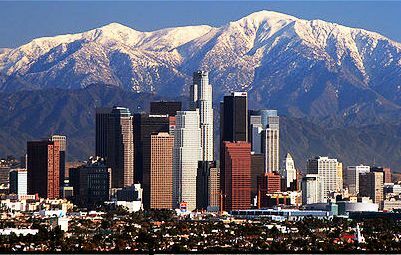 Home to a plethora of public and private universities, Los Angeles is one of the premier cities of the world, a center of business, entertainment, culture, and education on Southern California's west coast. UCLA and Loyola Law School are just two of the institutions located here. The population is almost 4,000,000. HPhoto of downtown against the mountains courtesy of Wikipedia and Nserrano. According to the NAR, the median sales price in the third quarter of 2014 was $481,900, in the Los Angels-Long Beach-Santa Ana area. According to City-Data.com, the crime rate has shown a steady decrease in the last 10 years, and was lower than the national average in 2012.